This year's Association of Moving Image Archivists (AMIA) conference was held in Pittsburgh, Pennsylvania. In this Notes Part 1, attendee and friend of CCJ, Mitsuru Maekawa shares his notes of the sessions. The Dave Rice/BAVC QCTools software has provided the A/V preservation community with an invaluable tool for analyzing digitized media. 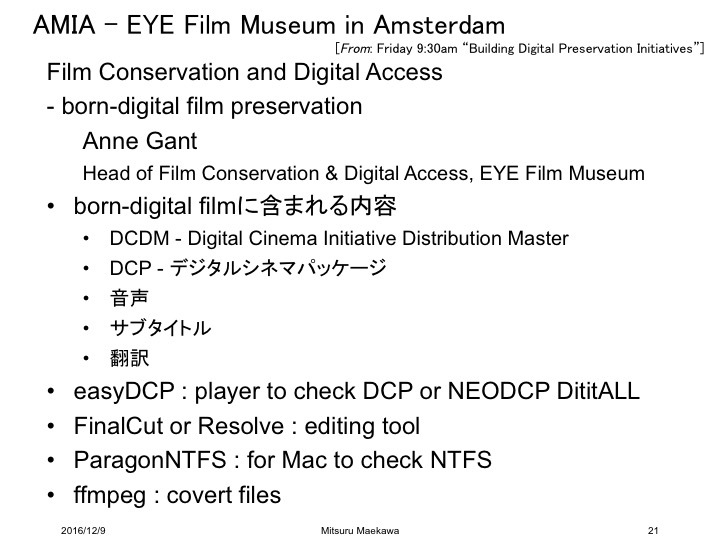 This presentation discusses open-source, python-based tools have been built to read and analyze QCTools reports in order to help automate and streamline the process of video analysis for digitization workflows. This panel will introduce tools that may provide an open-source alternative to QC software systems that are too costly or difficult to implement for smaller institutions, as well as provide an opportunity to advance the discussion of what it means to control for quality when digitizing archival AV materials. 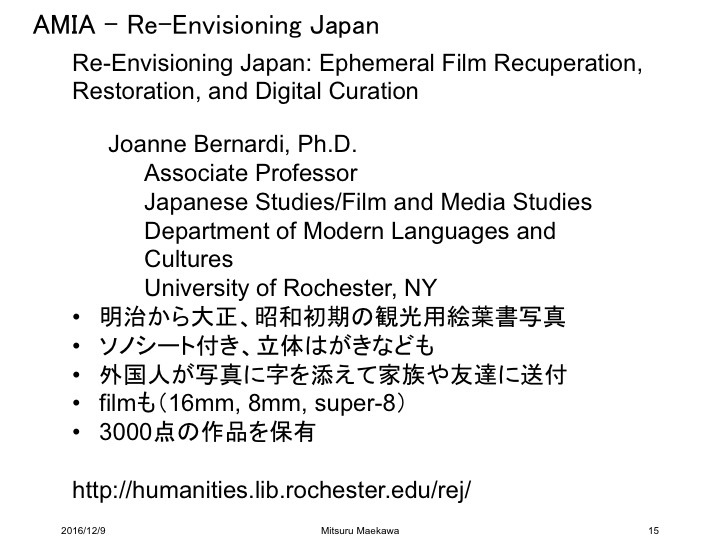 “Re-Envisioning Japan: Japan as Destination in Visual and Material Culture” (REJ) is a multimedia and digital archive of tourism travel and educational ephemera documenting changing images of Japan and its place in the world in the early to mid 20th century. This panel focuses on exposing participants to strategies for expanding or scaling up digital preservation initiatives. Speakers will present case studies focusing on how they have successfully improved, ramped up, or built digital preservation program from scratch at their respective organizations. This session will provide insights from rights experts working within two leading organizations digitizing many thousands of hours of audiovisual content with accessibility as a primary goal. Presenters will include Greg Cram, Associate Director of Copyright and Information Policy at New York Public Library and Jay Fialkov, Deputy General Counsel at WGBH. 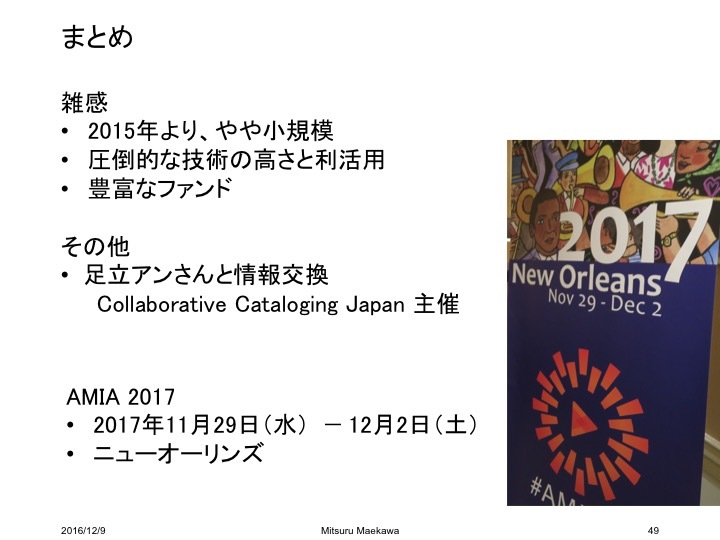 Almost two years ago, NARA and Historypin launched a project to digitize its contents. NARA is launching an app to deliver moving images and photos to museums, teachers, and coders. How do we best make sense of past hybrid media forms in the present? 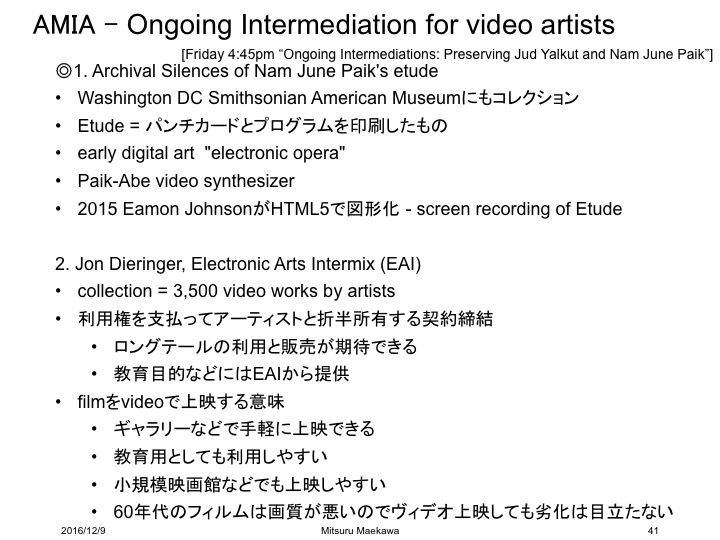 This panel, investigates theoretical and practical approaches to understanding and preserving the moving image through the work of pioneering media artists and frequent collaborators Jud Yalkut (1938-2013) and Nam June Paik (1932-2006). Standards created the physical and file-based media whose content we preserve. Standards are now taming the wild west which exists with the vendor-specific technology-based data sets of digitized content now being created, from audiovisual files to metadata, to cataloging records. But what about the data as a whole? How you plan, select and implement data storage hardware and software determines your data set’s long term survivability. This session will cover: How to design a data set for the long-term survival both of the content itself and other data set being stored over time; The new data archiving standard AXF (the Archive eXchange Format, SMPTE standard 2034-1), how its designated for long-term data survival, the current & future hardware & software problems it’s designed to solve, and how it is being implemented; How to design workflows and choose technologies and/or data set vendors wisely.